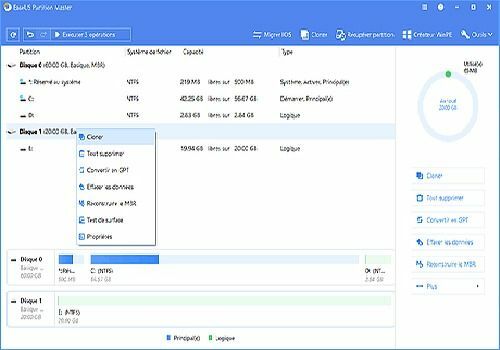 EaseUS Partition Master Free, the best solution to create, delete, resize/relocate, merge, split, delete or format partitions to make better use of hard disk capacity. Extend the NTFS system partition without rebooting for maximum PC performance. Securely merge two adjacent partitions into a larger partition without data loss. Convert the dynamic disk into a basic disk and system file from FAT to NTFS. Convert primary partition to logical partition vice versa: Convert a primary volume to logical to create a fifth volume on a disk with 4 existing primary volumes. Linux partition manager: Easily delete, create, format and recover the EXT2/EXT3 partition, etc. Support any RAID hard disk, removable storage device, hard disk, GPT disk, GPT disk and FAT/NTFS/EXT2/EXT3 file system. Run simultaneously on BIOS-based and UEFI-based hardware. What's new in version 12.10? Resize/move the partition faster with better performance. The new features of version 13.0 ! redesigned user interface: simpler and more intuitive !! new feature: fast recovery protects data when movement/resizing processes are interrupted. A professional partition management software. It can do basic and advanced operations such as resizing partition, merging/splitting partition, migrating OS to SSD etc. All-in-one partition management software. It can surely perform partition management without data loss, such as resizing, saving, updating. Sometimes copying disks or partitions can take a very long time.... This is now over with XXClone, which is a one-click copy software. Reorganize your hard disk space visually and simply with this bootable disk image.